This line, “Please open eyes to the desperate situations of the needy after Nepartak typhoon!”, was posted on Facebook by Chou Shi-lun, a renown documentary footage director. “Even a donation with 50 or 100 NT$(about 2 ~ 3 US$) would be fine”, asked humbly Mr Chou, adding that this is his last plea for the traumatized after Nepartak typhoon. 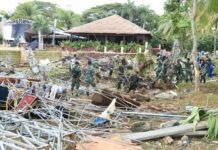 After Nepartak swept across Taiwan in the early July, there are still innumerable devastated households waiting to be repaired or restored up to date. 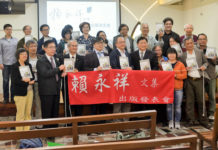 Though PCT’s Church and Society Committee, working with some charity foundations, has raised NT$ 1.25 million to help proceed a recovery project for the needy, a lot of money is in shortage to reach a target set up as NT$ 34 millions. As Nepartak caused the biggest windy devastation since the Dinah typhoon in 1965, many groups of volunteer workers, like Taiwan Heart, Enlightening Taiwan, TSP, Love In Rear Garden, and Infinite Love, came to eastern Taiwan to help rebuild the damaged households after Nepartak’s havoc on July 9, which was the date Mr Chou arrived in Tai-tung with PCT’s first aid rescue team. Facing the impact of several successive typhoons, though, these volunteer groups persisted their repairing works under a very hot weather in July and August. PCT also initiated a fund raising project for supporting the needy after Nepartak in the early September. According to Chou, PCT had already paid NT$ 4 millions in advance, offered 5,000 units of humanitarian workforce, and restored over 70 households within 137 days after Nepartak typhoon swept across Taiwan. “As those typhoon-devastated households’ owners, unwilling to fix their rented chicken hut or pig house, had took away the compensations reimbursed by local governments, the situations of those most needy become incredibly desperate like the deserted orphans forgotten by Taiwan society!”, lamented Chou. 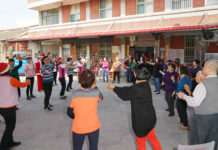 Through the volunteer workers’ Facebook at Love In Rear Garden, Chou urged people to donate winter clothes to the most needy after Nepartak, especially when a cold winter is around the corner. PCT also reminded Taiwan society to carry on supporting the needy after Nepartak via a special account, No. 024500128913, opened at Kon-gwan branch of Union Bank of Taiwan with the title as “Mission Foundation of PCT”. In order to solve once for all the problems after Nepartak typhoon, Chou Sih-lun, a renown documentary footage director, expresses that the devastated households do not only need an individual repair or restoration of their house buildings, but also need government’s help to facilitate their application for those relevant rights about their land ownership, tenancy, and etc.